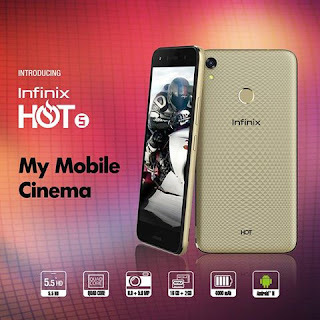 Infinix Mobility has finally launched the Infinix Hot 5 which feature a 5.5 inches FHD screen, a 1.5GHz dual-core MediaTek MT6580 processor , a 2GB RAM and a 16GB ROM , it also comes with a Fingerprint Sensor , also an 8mp rear camera and a 5mp back camera , it comes with Android version 7.0 (Nougat) out of the box and finally backed up with a 4000mah battery . The phone is indeed cool.for infinix users, but I'm surprised of something..front camera 8mp, while back 5mp, please Mr admin is it so or mistake? because I haven't seen anything like this before. Judging from the spec sheet made available by our oga at the top, lots of stuffs have been Nicodemusly watered down starting with the RAM down to the ROM.